Create new Google Analytics (GA) Accounts, Properties and Views and/or audit an existing account. Configure conversion goals, filters, account integrations, advanced segments and cross-domain tracking within GA. Prepare an accurate, reliable and repeatable process for campaign tracking code creation and stewardship. Demonstrate a working knowledge of Google Tag Manager. Develop meaningful and actionable reports for a variety of audiences from senior leadership to content marketers and media tacticians. Use Google Data Studio to automate your reporting process. Compare and contrast different attribution models. Utilize analytics documentation and other tools to improve measurement efficiency and advance your analytics program. Cognitive Technology: The End of Marketers and Marketing As We Know It? What’s Technically Wrong With Your Website? You Don’t Know What You Don’t Know, but Predictive Analytics does! Calculate annual test impacts in a more accurate manner than past models. Get your networking on. The opening reception is a great opportunity to make new industry connections and reconnect with old friends too. Hoist a beverage or two while you reflect on today’s awesome content. 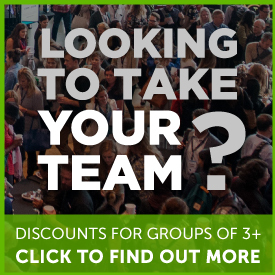 Mingle with onsite exhibitors, speakers, and fellow attendees to talk shop about your biggest marketing challenges, while having some fun in the process. Craft content that not only showcases your product, but that also EXCITES your audience. Carlos Gil, Gil Media Co.
Before you say adieu…join us for a last hurrah. Have a final toast to your new chums, and cheer each other on as you go out to use your new marketing powers and ideas for good. Sadly, DS is over for this year, but applying all your new digital marketing knowledge and insight is only just beginning!